The OH's 2x great grandmother, Annie Jones and her parents were some of these incomers, but they had followed a complicated migration route before settling in Carlton. Given the complexity of their origins I wonder what accent they fetched to the mix? The census snip above from 1871 gives just a snapshot of how people from many different places found themselves thrown together in Victorian England. Engine Brow was a cluster of cottages built about 1850 near the cotton mill at the junction of Station Road and Bolton Road in Pendlebury. By 1894, as the map snip below shows the cotton mill had gone but the cottages remained for a while longer vanishing along with the adjacent bleachworks in the 1930s. The head of this household in 1871 was Mary Bailey, aged 63, a widow, from Salford. Mary and her by now deceased husband John had been recorded at Engine Brow in the two previous census returns, 1861 and 1851. John had been a cotton dyer and his daughters had been employed as weavers and spinners in the mill. By 1871 Edward Jones and his new wife Martha are living with her mother - at the bottom of the snip is little Annie aged just two months, yet Martha is still working in the mill as a weaver. Her illegitimate daughter, Mary Ann Bailey, aged 7 is present too although the census listing is sufficiently vague that you might think Mary Ann was the Mary's daughter. Intentional obtuseness when the enumerator asked his questions or just a confusion, who knows? Neither Edward nor Martha signed their names on their marriage certificate suggesting they were illiterate so they would not have filled out their own return. Edward's place of birth is given as Staffordshire, although no town is specified. The little cottage would have been very full, as living with the extended Bailey family are two boarders, the elderly Alice Rothwell, occupation 'Sick', who came from Bolton and Mary Hin from Ireland, a spinner, presumably at the cotton mill nearby. Imagine the cacophony of accents in that household! Luckily Edward just appears on this 1851 census return at 8 months of age, for by the 1861 census his parents appear to have died and he and his brothers are living with his uncle. However cross comparing the names of his siblings, and the maiden name of his mother gives me confidence that this is the correct family. The head of the household in 1851 is Charles Jones, aged 32 from Flint in North Wales, who married Elizabeth Maddox in Dudley, Staffordshire in 1842. The three sons named in 1851, Thomas, Robert and Edward, plus additional siblings yet to be born Charles and Ann are living with Thomas Maddox, brother to Elizabeth in 1861. As Ann is six years of age in 1861 their Welsh father Charles Jones must have lived long enough for the older boys to have absorbed some of his accent. Moving to live with their uncle, a native of Bilston like their mother after their parents presumed deaths they might have lost this influence, but as Thomas's wife Rachel comes from Newport in Shropshire, yet another dialect thrown into the mix. Edward and Martha visit Barnsley for long enough to have a son, Edward in Hoyle Mill in 1879, according to the 1881 census return - however on that return they are living in Stonebroom near Chesterfield in Derbyshire. The family must return to Barnsley again in the next few years as Annie Jones marries Herbert Benson, himself an incomer from Thornhill in West Yorkshire, in Darton near Barnsley in 1890, however I can't find Edward and Martha in the 1891 census - are they in Barnsley or still in Derbyshire or somewhere else entirely? Annie's accent will have been a mixture of her mother's Mancunian, and her father's Welsh and Black Country - but she may well have felt right at home in Carlton, Barnsley as there was a large contingent of migrants from Wales, so much so that there was even a Welsh Chapel for many years. Did this influence the settling of the family in Carlton? 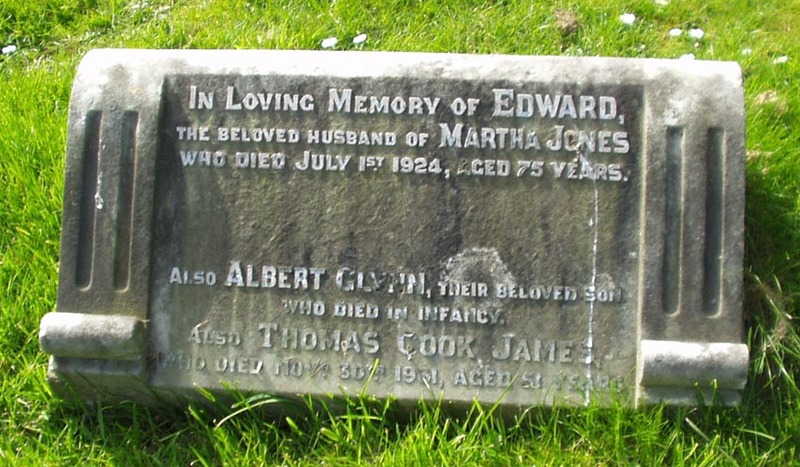 We may never know, but that is where, after many years of travel Edward and Martha settled, having one last short lived son in 1901 and being buried together in nearby Royston cemetery.